For less than $250. Web surfing, personal finance, music, word processing, a bit of photo editing maybe, everything you need for under $250. Who would shrug that off? The guys at Computer Shopper put together a machine from NewEgg.com (my fave computer shopping site in the US) that does everything the average person wants for a piddly little price. Link here. The software it runs? 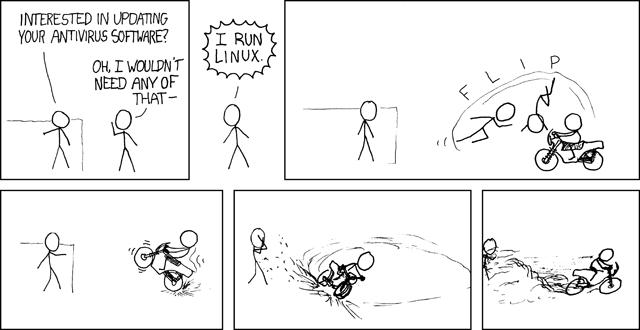 Absolutely free, of course – it’s all about Ubuntu Linux these days! Works a treat and is easy to use, plus you can open and edit Microsoft Office documents, Adobe photo files and more. Seriously – I really don’t know why more people aren’t giving it a try. Just because you’re used to something doesn’t mean it’s the best, cheapest or easiest! Tonight’s the night I try out the new power supply that was delivered today. I got a Scythe Infinity CPU cooler to go with it too, so that down the road I can fit more RAM on the motherboard. The cooler is bent quite a bit, though, so it’ll have to be returned. At least I’ll be able to see if if fits in the case. All that is beside the point, though – I need to make sure the computer starts up OK with the new power unit, after that I’ll worry about fixing up the rest of the computer. I also got the fletching jig and new vane/fletchings for my arrows, which will probably be interesting to try out, considering there are no instructions with the jig! UPDATE: now posting this from my home computer, yay! I’m glad I got the new power supply ordered on Friday, I would have had to wait another day or two to get the machine running. I got a unit from an outfit called Xilence, it’s meant to be super quiet. I still have a bit of fan noise so I might unplug at least the fan in the back of the computer, which is an 80mm fan. Even better will be swapping out the front fan (80mm) for a 120mm fan, which spins slower and is therefore quieter. Anyway, I’m off to figure out why my Azureus downloading proggie isn’t working! My computer is bust. Was online all night the other night, and in the morning it was off. Could have been a power cut, I didn’t think it had crashed so bad as to shut itself off. It hasn’t crashed in a while, anyway. So I go to turn it back on and it just…won’t…turn on. Tried a few things to clear the BIOS and CMOS, whatever, that didn’t work, it still shuts off after a few seconds. Probably the power supply now, so I’ve ordered a snazzy new very quiet power supply along with a new CPU cooler. I’ll be needing a new cooler anyway so I can fit more RAM in the computer (the one I have is sweet but so low-profile it won’t allow me to fit 4 sticks of RAM on the motherboard). Anyway, at least it’s payday and I won’t be on the computer over the weekend anyway so at the moment it’s not a big loss. I got a bit more reading done yesterday, that’s all. * Virus, Adware, Spyware, etc. So far the main difference between using Windows XP and Linux has been that there has been no need to install antivirus, antispyware or antiadware (popup) programs. Granted, because I always stayed very up to date with Windows updates and the latest (free) antivirus (NOD32 or AVGFree), spyware (SpyBot Search and Destroy) and adware (Lavasoft AdAware), I never had a virus or adware pop-up invasion. But other people do, and there have been reports of people even throwing away their entire computer to get a new one. These are the folks that would benefit most from a switch to Linux, I think. Another difference is the ease of looking for new programs, installing them and removing programs you don’t like or don’t use. I mentioned this before, but it’s basically as simple as two clicks to see a huge searchable list of hundreds programs (separated by category), then you tick the boxes of the programs you want (or untick the programs you want to remove), click ‘OK’ and the machine removes or installs the programs as needed. No restarting, nothing, and you can go on and browse the web or whatever while that’s going on. The main issue: playing Flash video (FOR 64-BIT SYSTEM *ONLY*) – this was merely annoying, because I couldn’t view YouTube videos or Flash-embedded videos on other websites. This was solved recently by a user on UbuntuForums.org going by the name of ‘Kilz’, who wrote a script that solved all the 64-bit & Firefox problems. For normal 32-bit computers the hassle isn’t a major one, simply run a few lines of code as directed on the Ubuntu Feisty Guide online. 64-bit support for Ubuntu may be slower than 32-bit but it’s nowhere near as slow as for Windows! The even bigger issue: not installing graphics drivers. This was almost a showstopper, because Firefox (which uses a lot of memory) was crashing on me constantly when I was opening or closing a few windows. I tried alternatives like SwiftFox, Epiphany and SwiftWeasel, but they would crash also. I posted about the problem on the Ubuntu Forums and was reminded that I should have installed the latest drivers for my video card. Silly me, I should have known to do that! After installing the Envy program, job’s a good ‘un, no problems since. Minor issues include figuring out how to navigate the directory structure in the terminal (or console), and also setting file/folder permissions so I could move loads of files from old hard drives into my personal directory on a new hard drive. Recently (well, recently in home computer use time, in real time it’s maybe 2 months ago!) I got a new hard drive for my main computer at home. It’s a 250gb SATA drive to replace the two 120gb IDE drives that I had installed previously. The IDE drives will go to: A) a local server/bittorrent client file server machine that I need to finish building, and B) a media PC that I need to finish building, which will act like Tivo/Sky+ for me. I realized after I had everything installed and running on the new drive that I should have gotten a 500gb drive instead of the 250gb, after all why upgrade to a single drive that’s marginally bigger than the drives I had installed (even if it is much faster) when I could more than double my hard drive space for not much more money? Oh well, live and learn. By the time I actually fill the new drive, prices will probably be even lower than they are now, and besides I’ll be shifting a lot of the stuff on the drive to the file server anyway. So anyway I’ve been struggling recently with crashes when using my Ubuntu Linux, at first it seemed that Firefox was the problem so I tried different browsers but that didn’t fully solve the problem. CPU time and memory usage seemed to be the indicators, and Firefox is notoriously memory-hungry. With help from various users on the Ubuntu Forums I was able to sort out what it was: I hadn’t installed the current video drivers on the machine, and the system wasn’t able to handle the load and would dump me to the login screen. I’d been meaning to anyway, but I was encouraged to load in the Envy script for Ubuntu, which basically autodetects your video card, installs the latest correct driver for it, sets the video settings for Ubuntu and lets you go on your merry way. This is awesome because ATI is notoriously bad for providing Linux support (well, ‘bad’ in that Nvidia, their only competition, provides good Linux support for their stuff! ), and this guy basically wrote a program that does all the file finding and conversions, etc., for you. Err…me. While I was at it, I installed user Kilz’s script for enabling 64-bit Flash in Firefox, which is amazing. It’s amazing because Adobe (who bought Macromedia recently, the people who made Flash in the first place) is notoriously bad for providing Linux support for their products. Having a functional YouTube site (or any other video site) is awesome because since I installed Ubuntu Linux in March I haven’t been able to see Flash videos on websites! It’s getting better and better, really it is. No, it’s not perfect and it’s not for everyone and I’m still getting the hang of installing programs and movie codecs, but damn if I don’t have to worry about trojans, viruses and spyware.